rodeasdown.com.au – Quadraphonic is back. Quadraphonic is back. And it sounds great. For readers of more tender years let me explain that quadraphonic was the first surround sound system that got a major shove from manufacturers and retailers. This was so long ago that it was designed around audio, not movies, a four-channel system adding two rear channels to the front left and right. Musical purists could get the rear fill of a concert hall where reflected sound comes from the back, while the less serious got off on groovy effects like having fighter jets taking off overhead, locomotives rushing from ear to ear or being in the centre of a pinball machine. Quadraphonic was developed in the 1960s and by the 1970s was in the shops in two formats – eight-track tape cassette and record. Deutsche Grammophon (DG), a leading recording companies in classical music then and now, was an early adopter and used four-channel recording and master tapes to make all its offerings. If you have a technical bent you’re probably wondering just how it managed to get four channels of sound from a single record groove. The approach DG adopted was ingenious but complicated and necessitated extremely accurate tracking by the stylus. Both rear channels were frequency-modulated to around 30 kiloHertz, well beyond human hearing, and a decoder between the turntable and amplifier brought them back to an audible level. The sound quality wasn’t as good as at the front but given they were fill this wasn’t a major worry. But music buyers weren’t interested in buying four-channel amps and extra speakers, and quadraphonic died. DG, however, held onto around 800 pristine four-channel master tapes, digitising and remastering as necessary. One of these is the Boston Symphony’s recording of Holst’s The Planets conducted by William Steinberg, recorded in quadraphonic by DG in 1971. Accepted wisdom with Holst is to buy recordings conducted by Sir Adrian Boult, Holst’s favourite, and Steinberg was not a Holst specialist. But DG liked his work and recognised that he’d brought the Boston Symphony out of relative obscurity and raised it to one of America’s leading orchestras in just a couple of years, so it approached him to record The Planets. He learned it, rehearsed it, tried it out, made the recording and according to the critics of the day, nailed it. But the people who could play the quadraphonic release were few and far between and the four-channel recording went largely unnoticed. These days anyone with a surround system can play four-channel recordings, it’s just that the centre channel and subwoofer remain idle. And someone at DG connected the dots. With no movie on the Blu-ray disc the quadraphonic Steinberg Planets is presented in 24-bit/192-kiloHertz format and was released earlier this year. It’s stunning, sounding better than plenty of super audio CDs. The music is brilliantly executed, the recording is top notch. If you have good speakers and a quality Blu-ray player it’s airy, expansive, atmospheric and very exciting. The rear channels add so much depth and spaciousness that if you close your eyes you’ll waft along on a wave of music that seemingly has no boundaries. The word immersive is frequently used in audio but here it’s at last accurate; this is an immersive experience. And you’ll get down on your knees to check that the centre channel really isn’t operating. Actually I did this more than once. In Molly’s words, do yourself a favour. 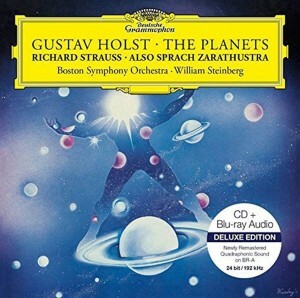 By the way, Steinberg was a Strauss specialist and the disc includes Also Sprach Zarathustra. Equally stunning. A regular stereo CD is included as well, also in 24/192.